As the market responds to its first foray into correction territory this year, and on the heels of the Dow’s largest single-day point decline in history, it’s natural to have concerns about your investment portfolio and wealth management plans. 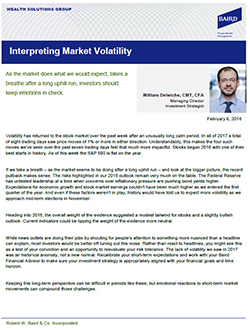 Investment Strategist Willie Delwiche explains why the recent pullback and current market volatility are not only normal in the context of current events, but also represent an opportunity for investors. 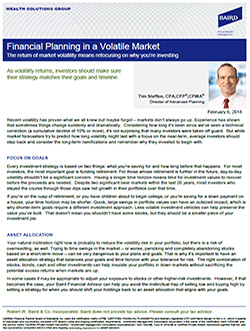 Tim Steffen, Director of Advanced Planning, discusses the implications of current volatility for your financial plans, and the often counter-intuitive psychology of long-term goal-based investing. To discuss how these insights could impact your investments and wealth management plans, contact your Baird Financial Advisor.